I just finished reading this book by Robert Kiyosaki. It took me a while to actually finish it since I got a lot of stuff going on lately. 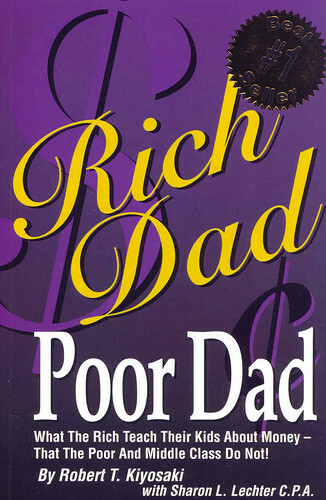 The book shows the conflicting views of Robert's rich and poor dad regarding making money and building wealth. Their contrasting views reflect that of how society looks at wealth and money differently. It is actually an eye opener for those who think of accumulating wealth the wrong way. I love how the book gets you to the mind of the rich and how they actually make money work for them instead of the other way around. I would definitely recommend this book. "Children spend years in an antiquated educational system, studying subjects they will never use, preparing for a world that no longer exists." "Learn to use your emotions to think, not think with your emotions." "Intelligence solves problems and produces money. Money without financial intelligence is money soon gone." "It's not how much money you make, it's how much money you keep." "An intelligent person hires people who are more intelligent than they are." "Employees earn and get taxed and they try to live on what is left. A corporation earns, spends everything it can, and is taxed on anything that's left. It's one of the biggest legal tax loopholes that the rich use." "The words "I can't afford it" shut down your brain. It didn't have to think anymore. "How can I afford it" opened up the brain. Forced it to think and search for answers." "In today's fast changing world, it's not so much what you know anymore that counts, because often what you know is old. It is how fast you learn. That skill is priceless."